Alfonso Cuarón's Children of Men celebrated it's ten year anniversary in 2016 and a little resurgence in popularity. Perhaps it was its sense of unraveling chaos that made it appropriate in the year of Brexit votes, American elections and several refugee crisis that made it feel sadly all too relevant. Of course it could be that is just simply a brilliant piece of compelling dystopian sci- fi that it was so fondly remembered. After all the film is based around events in a future we are yet to see. In 2027, in a chaotic world in which women have become somehow infertile, a former activist (Clive Owen) agrees to help transport a miraculously pregnant woman, Lee (Clare-Hope Ashitey) to a sanctuary at sea. As they battle their way through camps of discarded people, lines of soldiers armed to the teeth ready to fight and infighting rebel forces the urgency increases. As they take shelter in a dilpidated block of flats the child arrives. This is sadly not a miracle to be celebrated, the pair quickly attempt to leave with the newborn wrapped up and hidden away but a single cry breaks into the chaos and everything stops. Warring factions stop, guns fall silent, cries of anger cease, everyone stops to see if it can be true. Everyone needs to see it to believe, they've been told this can't happen, isn't possible, but in that moment the narrative of what everyone knew to be true changed. It has happened, it is possible, and in that single moment everyone, as astounded as they are, realises the significance of what they've witnessed. 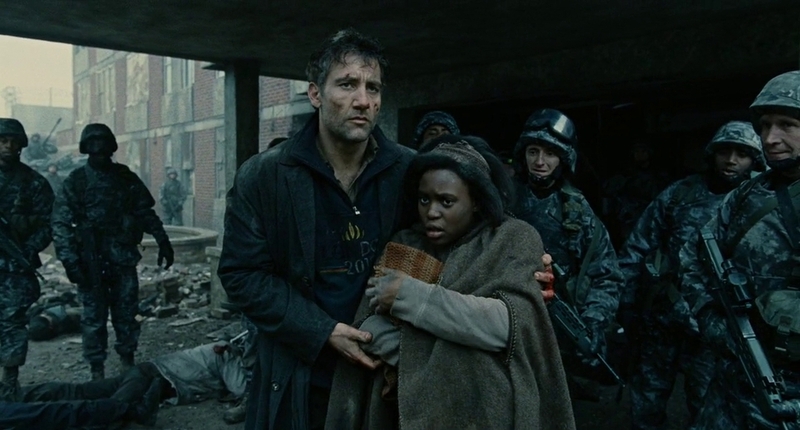 Children of Men is not just a great piece of sci-fi but a great Nativity film too. Everything about that story is an impossibility. We've heard it so often we've become numb to it. We've picked it apart, applied science, rational thinking and logic and it doesn't compute anymore for some of us. In Children of Men the circumstances defy logic and don't compute either, but in that moment there is wonder and wide eyed amazement. The realisation that something new is happening, that the world we know and understand now tells a different story. Perhaps this year, listen again to the familiar story and become lost in wonder again. Hear a different story and have the world as you understand it changed.